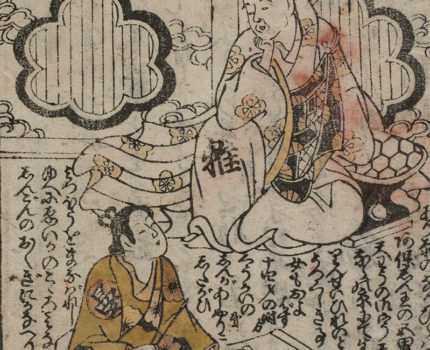 In the second half of the eighteenth century the entrepreneurial Edo publisher Urokogataya issued a number of picture-books (kusazōshi) that were adaptations of earlier literary works. There were many challenges facing Urokogataya and his illustrators in recasting this past tradition: How to adapt relatively lengthy source texts to a shorter format of fifteen folios? How to fashion the language of the source texts into something that a reader with limited literacy could understand? How to create new images for tales that had already been released with illustrations? After an introduction to the physical qualities of the picture-books from the Urokogataya firm, this talk will address these and other questions through an exploration of three Urokogataya picture-books that feature three figures well-known in previous literature—the court poet Ariwara no Narihira, the quack doctor Chikusai and the eccentric monk Ikkyū. There will also be the opportunity to view first-hand original Japanese picture-books that were contemporary with Urokogataya publications. Dr Laura Moretti is a Lecturer in Pre-Modern Japanese Studies at the University of Cambridge and a Fellow at Emmanuel College. Her research focuses on early modern Japanese literature, with a special interest in popular prose. She has published in English and Japanese on a variety of topics that include seventeenth-century prose, early modern ephemera and parodic rewritings. She is also actively engaged in the training of scholars in the palaeographical skills required to decode early modern manuscript and printed materials. 21 December 2017 – Professor Toshio Watanabe, Sainsbury Institute and University of the Arts, London. 18 January 2018 – Dr Simon Kaner, Sainsbury Institute and University of East Anglia.